My name is Hayley and I live in Essex, England. I am 18 years old and live with my Mum and Step Dad. I have three Brothers, a sister in law and identical twin Nephews. I also have two cats and a very cute dog! On Tuesday 20th November 2007 I was diagnosed with cancer of the layrnx. I noticed a few years ago that my voice started to go a bit husky but I didn't think anything of it until it really started to go hoarse and people started asking me all the time if I had a sore throat or not. I couldn't sing or shout and it was really getting me down. After a lot of procrastinating I finally went to the Doctors about it and he said to go back in a few weeks if my voice had not changed. Which is hadn't...so he referred me on to the ENT at the local Hospital. When I had my appointment I had a camera shoved in to my nose and down my throat, I really panicked about it but it was no where near as horrible as I expected lol. The Doctor then noticed I had a polyp on my left vocal chord (boy was I relieved...) and scheduled for me to have it removed within the next couple of weeks. I got my operation date through (17th October 2007) and I had the surgery to have it removed. I had different people tell me different things about voice rest so I decided to take the first Doctors opinion and didn't use my voice for two weeks. After the two weeks it didn't come back but I kept trying and trying...I had one appointment with a speech therapist and she told me that it would take a while for it to come back and that I had to do vocal exercies every day. I was scheduled for another appointment the next week but the woman phoned and cancelled it the day before. The 7th of November 2007 was my check up with my consultant after my operation. My Mum and I walked in to the room and she didn't look very happy...I thought maybe she had a bad day or something lol. She basically said that when she removed the polyp she noticed what she thought were warts underneath the polyp...just going in to my voice box. She said that I wasn't meant to be discharged from the Hospital until she had explained what was going on but the Nurse let me go anyway. Grr. Basically...she said that she sent the 'warts' off to be looked at and they wern't warts. She said that she didn't think it could be cancer because throat cancer is SO rare in someone my age. She ended up sending it off to London to see looked at by a Professor and scheduled an appointment for the 20th of November 2007. Meanwhile I was booked in for a CT scan, had that done and got a phone call saying they had booked me in for an MRI scan. I had no idea that they knew I had cancer at this point, but they did. Roll on 20th of November, me and my Mum go to the Hospital and I just have this feeling that it is cancer. Walk in to the room, my consultant says to me "Have you been getting out of breath lately?" and that's when I knew for sure I had cancer. She said "Well, we got the results back. It's what we thought, you have got cancer." I was just like "Oh ok....that's a bit crap isn't it!?" - she then said that it's never been seen in someone so young for me and that they're trying to figure out the best treatment for me that enables me to have a good, long quality of life. The Hospital are being fantastic, specialists/surgeons from over the country had a meeting on Friday 23rd November to take a look at my MRI scan and discuss what they believe is best for me. They decided to refer me on to a Hospital in London (Charring Cross) and I will be having laser surgery within the next couple of weeks to remove the tumour and then they will decide what will happen next. I have an appointment at my local Hospital tomorrow afternoon at 2:25pm to ask them a ny questions I have and talk about what's going on. The thing is...I have absoloutly no idea what to ask! Maybe I'll have to look around online at what people asked their Doctors when they had just been diagnosed with cancer. Yes, I am very very scared that I have cancer. Yes, I have horrible thoughts going through my head but NO I am NOT going to let cancer beat me. I'm 18, I have a good life ahead of me and I intend to live it to the full until I'm in to my 100's. Ok...maybe 70's/80's lol. I will update tomorrow after my appointment at the Hospital. you go girl, you will beat this bugger! I will have a look back to see how your doing, best of luck!! you will beat this hun! we're right behind you. you rock girly! 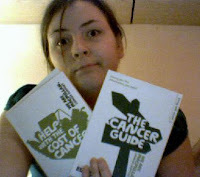 I love your positive attitude..AND love your blog name..."kicking cancers Arse" and YOU WILL. Glad you have somewhere to come and write about this journey. Lee and I are here for you, if you need ANYTHING, just let us know. We both know you'll beat this and live a loooooong, happy life. Hopefully we'll be able to bring you to the US soon so you can meet us and your twin nephews. I am a reporter for the Essex Chhronicle and I am really amazed by your bravery - would really like to talk to you more. Perhaps you could get in touch with us. I am a reporter on the Essex Chronicle and wopuld be really interested in speaking with you. We all know that you will get through this, you have been strong since the day i knew you! (a very long time ago) please dont give up now... we are all behind you!!! 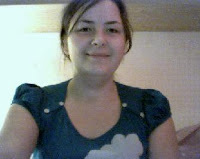 Ronread from quitnet saying hi from the USA. just want you to know that you are being thought of and are in my prayers. We are going through chemo with my aunt right now, she has a rare cancer too. It's a long road but you can get through it with faith in yourself and your family and friends' support. I'll check in with your blog so keep us posted when you have the energy. Go kick some cancer arse!!! Wow. That really is a lot to deal with for a young lady. You are handling it very well. I am sure you must be very scared. I pray that things work out well for you. There are some wonderful people at the Q who are willing to give support. I put together quit smoking web pages and I would like to share your story w/ other people from the Q. I think your story would definitely help a lot of people in their quest to quit smoking. Hayley, You hang in there and fight with all you have! We at the Quitnet in the US are all rooting for you, praying for you, and sending you all the good thoughts we can muster! I will keep you in my prayers daily. Now go kick cancer in the bum! hey darling, i am so proud of you! this blog is a great idea. i remember you were a beautiful baby and now you have grown into a strong, beautiful woman. you are an inspiration to all of us!! i luv u very much. luv aunty gina.